With the breakthrough of the two 10 kilometer long main collectors of construction section 40 in Oberhausen the tunnelling work for the construction of the Emscher sewer has been successfully completed. Between October 2014 and June 2017 the two EPB Shields (Ø 3,397 mm) used by construction company PORR achieved genuine peak performances with the support of Herrenknecht service experts. 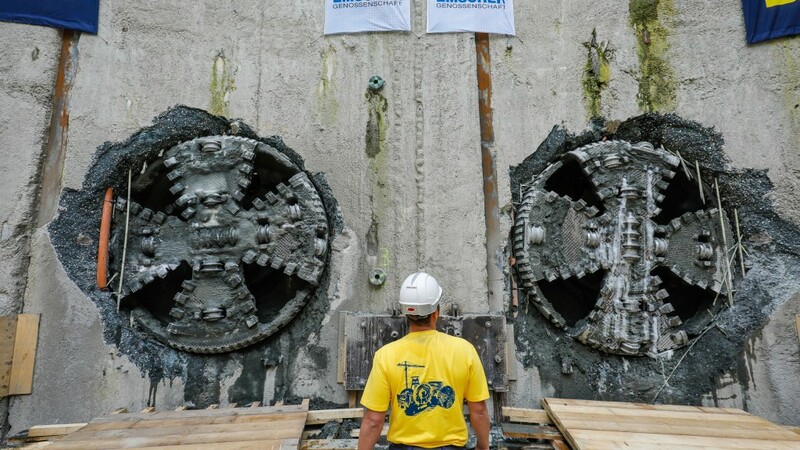 Thanks to their strong teamwork, the site crews were able to keep the average machine availability above 95% over the entire tunnelling period. The result was outstanding top performances of up to 177 meters per week and up to 582 meters per month, which played a decisive part in the success of the overall project. The two EPB Shields were the only machines in the entire project using the segmental lining method. With an inside diameter of 2.6 meters, the twin tubes are among the smallest segmentally lined tunnels in the world. The entire tunnelling system with a length of around 85 meters was designed to be accordingly compact. The logistics were also adapted for the small diameter. Thus, for example, a muck removal concept with a locomotive was used, where excavated material was transported in buckets to the shaft and the finished segments were transported to the tunnel face. One of the special tasks in the realization of construction section 40 was the technically demanding tunnel alignment with several, partially tight curve radii of up to 200 meters. The alignment runs mostly below the A2 motorway and a multitude of inner city supply lines. In addition, an approximately 300 meter long geological fault zone with sandy and groundwater-bearing subsoil had to be passed through. The limited space available at the total of three launch shafts necessitated an optimal logistics concept. For these requirements, solutions were developed in advance and successfully implemented by the site crew during the construction phase. Work on the overall Emscher conversion project began back in 1992, covering more than 400 kilometers of new underground sewer tunnels. The inhomogeneous ground, the pipe position in up to 40 meter depth, the long pipe jacking distances, the partially complex logistics and the wide range of different construction situations posed particular challenges in the creation of the necessary tunnel structures. Over almost 25 years the contractors relied on Herrenknecht's project-specific tunnelling technology for the underground excavation work in construction sections 20, 30 and 40. This included numerous AVN machines for pipe jacking in the smaller diameter range, EPB Shields using the pipe jacking and segmental lining methods as well as a Vertical Shaft Sinking Machine or VSM to sink a 23 meter deep launch shaft. Over 60 kilometers of the main and secondary sections were built by contractors using Herrenknecht tunnelling technology. In individual construction phases, Herrenknecht Group partners supported the quick overall construction process. VMT supplied TBM navigation systems as well as various communication, data management and safety systems. Herrenknecht Formwork produced segment moulds and MSD supplied rolling stock, a lifting beam and a tilting table for the pipe plant in Gelsenkirchen. The Emscher, whose source rises in Holzwickede to the east of Dortmund, passes through a series of cities in the German Ruhr area on its 80 kilometer path before it flows into the Rhine. Since the beginning of industrialization around 1850, the small lowland river was used as an open channel for sewage, flood and rainwater and degenerated into the dirtiest river in Europe. With the renaturation of the stream, one of the main tasks of the Emschergenossenschaft founded in 1899, in future sewage and rainwater will be separated again, drained away underground and purified in intermediate treatment plants. As a result the river will become clean again in the long term and the quality of life of the people in the Ruhr area will increase. Commissioning of the 51 kilometer long Emscher sewer is planned for the end of 2020.